Last year, Ghost City Comics ran a great indie comic competition where creators could submit their work for prizes, but more importantly, professional feedback. One such comic caught my attention and even went to the final round with their comic, Genesis. Months later, and with an upcoming Kickstarter launching, I reached out to it's creators to talk about their journey over the last half year. Get to know writer Angelica Baini, and artists Jackie Albano and Tianna Harvey! Mikey P: How do you describe Genesis to those who inquire about it? 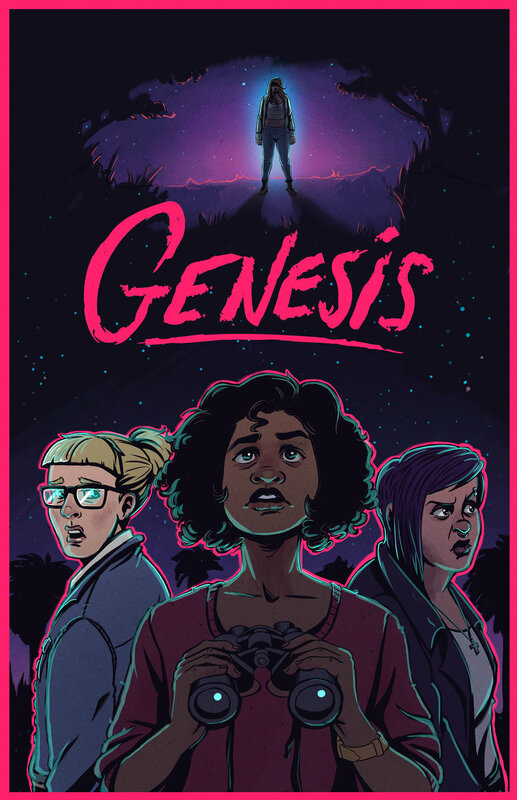 Angelica: Genesis is a sci-fi thriller about four Miami girls that go camping in the Everglades. It’s girl power, sassiness and well.. Miami weirdness. Jackie: It’s about communication, responsibility, and being prepared. All things necessary to survive the Everglades. Tianna: It’s a real good time, and an epic saga about friendship. Mikey P: I’m assuming you knew each other prior to this comic? Was this your first time collaborating on a project? Angelica: Yeah, we met as undergraduates at New World School of the Arts. We had film classes together they all starred and helped on set in this short mini-series I made called Apocalypso. I met Grace (who did the colors and storyboard) at school as well but worked with her professionally. Tianna: I was just an unpaid PA on her film. And the rest is history. After that we just started collaborating on pretty much everything. Mikey P: The contest Ghost City Comics put together brought a lot of self made comics to the light. Was Genesis something already made or did the announcement of this contest push things into full swing? Angelica: Genesis was actually written to be a short film. It was a semifinalist script for Borscht Film Fest too; The girls convinced me to make it a comic after. The comic was almost done, I was just working on lettering before hearing about Ghost City Comics. I was following Dark Beach on Instagram so that’s how I herd about it then. Mikey P: Big accomplishment to be selected as a finalist. What sort of feedback did you receive from judges and social media? Angelica: “A Place to Hang your Cape” made a really good review about it. I loved all the references they added that reminded them of the story. I thought they were spot on. On Instagram people comment and say nice things so it gets us excited for it. People on twitter as well, I had no idea comics were so big on twitter. Jackie: They liked our colors. That made me happy. Mikey P: If I recall what initially got my attention was the art, specifically the colors, which had an immediate impact on me. (Also, you being from Miami as well). How much direction was given for the look of the book between writer and artist? Angelica: In the beginning I had made guidelines for the comic which included colors, fonts, sizes and what I recently mentioned a mood board. For character design, the ladies made a couple of different options then in the end we went with Tianna’s. I was pretty open about how things were going to be laid out and cutting things out of the script. There was a lot of back and forth between all of us agreeing and disagreeing on things. I wanted the colors to be yellow, blue and purple but Grace who helped with colors and boards tested them out and the yellow didn’t work. Instead it was replaced with that pink color for highlights that I felt really made it stand out. Mikey P: You display personal portfolios which show an amazing and wide artistic range. Do you envision staying on a path towards continuing to make comics? Angelica: Hopefully, if people like the comic and it gets backed we can roll out Issue 2. I already started writing it just in case. Jackie: Comic making has always been one of my interest. So if the universe wills it, I would love to continue on that path. Tianna: We all have interests that pull us different ways, but I think comics are a good place to combine a lot of our skills into something we love and can be proud of. Motion graphics is another passion and also my day job, but it’s nice to be able to contribute to something bigger than just the day-to-day grind. Mikey P: What did you find was the most challenging and rewarding parts about this experience? Angelica: The most challenging was organizing who does what and how to divide the work. It was the first time I’ve ever tried to direct a comic. Since this was an experience now I know how to handle that part better. It’s a learning process. The most rewarding for me was when we all agreed on something haha. Jackie: Yeah, the best part was honestly finishing the damn thing. Tianna: Haha, making the whole thing was pretty challenging. Coming from a place where I wasn’t drawing a lot, to drawing whenever I could in my spare time. The most rewarding, I have to say, was finishing. And all of the support that we’ve gotten from our friends along the way. Mikey P: What sort of obstacles have you been met with in launching your Kickstarter? Angelica: Trying to decide how much money we need for printing, and the shipping. There’s a lot of research that goes into that. Tianna: The hard decisions like choosing whether or not an Edible Arrangement would be a good reward. Mikey P: Who is the audience you hope to reach with this comic? Jackie: I hope this comic resonates mostly with young women. I think Genesis does a great job at showcasing female friendships, and we could all benefit from seeing these kinds of stories more often. Tianna: I want to reach all the ladies who ever thought they weren’t represented in comics. And definitely South Florida, you know. This comic is definitely a love letter to Miami. Angelica: Anyone who will enjoy an indie comic and all the things they said! Mikey P: What sort of personal goals have you set for your careers? Angelica: I would love to art-direct anything. I think my strength lies in creating moods for things whether it be a short film, a poster, a music video, etc. Jackie: Personally, I would love to create my own comics one day and have my own stories come to light. I guess the goal for me is to just keep on creating. Tianna: Not to get pigeon-holed into being one thing is very important to me. So wherever I end up, I hope the road has a lot of twists and turns. Mikey P: What comics and creators have inspired you in your life to create your own? Angelica: I really liked Black Hole when I was younger, loved the line work on that. I love the dialogue between the girls of Ghost World. It was the first time I saw girls just chatting so bluntly like that. When we began working on the comic, Grace had so many great comics she lent us all to check out one of my faves was Michael Cho’s Shoplifter. I loved his palettes and the simplified colors. A little after that I remember reading some of Uzumaki, the horror manga. Ahh, it was just so scary and creepy. I think it inspired some of Genesis as well. Jackie: I actually grew up reading a lot of manga as a kid, and watched a lot of Dragon Ball Z. I always wanted to make my own sort of universes like those. Recently though, I’ve been really inspired by a lot of cartoon creators like Rebecca Sugar and Ian Jone-Quartely. Tianna: I remember reading Ultimate Spider-Man when I was a kid. I really love witty banter a lot, and that was probably my first comic obsession. Beyond that, it’s very hard to pinpoint those influences, but I’ve always loved watching TV and film. Mikey P: When you’re creating, what’s usually on in the background? Angelica: At the time when I wrote it, I was listening to some old Peruvian punk, and Female Garage/punk bands. I had a soundtrack in mind for this haha. Some of those songs were Los Holy’s - “Campo de Vampiros”, Los Ovis - “El Ovni”, Screaming Sneakers - “Violent Days” and also really loved synth stuff like Disasterpeace. 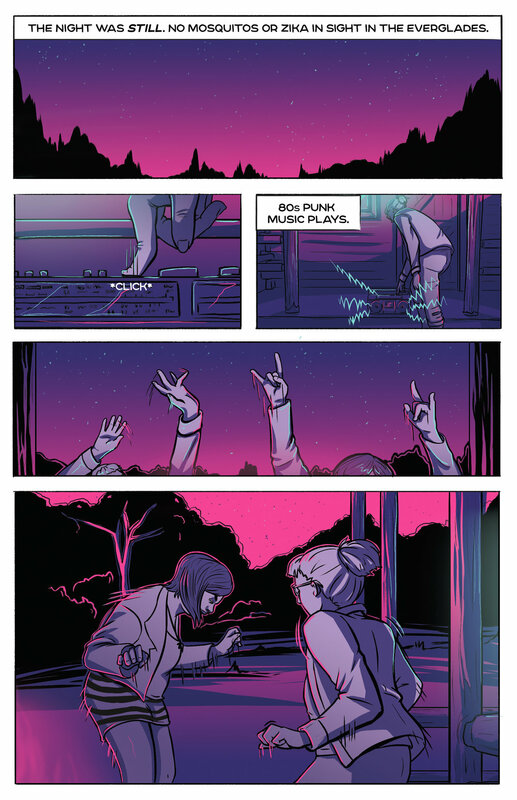 Jackie: I actually find that listening to music distracts me a lot. So my favorite thing to have running in the background is a lot of British television. That or some Wendy Williams. I gotta get the hot scoop somehow. Tianna: Haha, this varies a lot, honestly. Sometimes I’m listening to TV (Top Chef, Chef’s Table -- I have a problem). Sometimes I listen to music. Rap, hip-hop, alternative rock, indie stuff. But mostly Nicki Minaj. Angelica: I would say to try to make a comic or a book from scratch even if it’s a personal one you won’t publish, it would teach you the process from start to finish. I remember taking a book making class in art school. It was the first time I ever had to understand a book making process. It taught me patience, and that sometimes things don’t go the way you want them to but if you practice and test stuff out things will work out. Jackie: A lot of the time I find myself feeling like I’m never going to be as good as the artists I love on the internet or that there is just way too much competition to do anything. But I’ve learned the best thing to do is to just keep making work and to keep pushing yourself forward. Regardless if you feel like nobody is going to see it, keep on working. Tianna: As the legend Eminem once said, “ Don’t miss your chance to blow, this opportunity comes once in a lifetime.” I’ve always kept that in my head, and it’s never failed me. Thanks so much for your time and good luck on your campaign! Be sure to look for the Genesis comic Kickstarter on its release and follow these creators on their social sites.